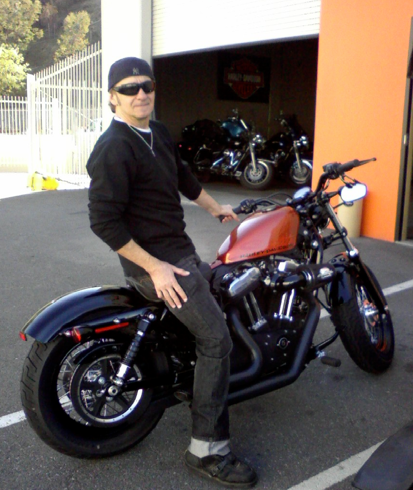 This month’s Biker Spotlight is on Los Angeles area biker who was born in Buffalo, NY, lives in LA, and rides a Harley Forty-Eight, in our opinion, one of the coolest Harleys on the market. Though often maligned by the Club crowd and many “Big Twin” riders, the Harley-Davidson Sportster has always had a special place in my heart. The history of the bike is as cool as they come, and after 55 years, the bike still retains much of its original styling. Almost as importantly to me, my first Harley was a 1978 XLC 1000 Sportster; my second was a 2004 XL1200r. The Sportster (aka Sporty) was first produced by HD in 1957, probably making it the longest continuously produced motorcycle models. We caught up with Fast Freddy, and asked him a few questions about his bike, riding, and life. A 2011 Harley Davidson XL1200X Forty-Eight. Any modifications on that bike? Vance and Hines Short Shots staggered/ Screamin’ Eagle Heavy Breather performance air cleaner kit, and Screamin’ Eagle Pro Performance software. What is your best riding story? On a solo ride up up the Coast Highway last summer to attend MotoGP at Laguna SecaMeeting, meeting “Ducati Dan” in Monterey, and having him point me towards the best Mexican restaurant in town! What was your worst riding experience? My recent crash when the dreaded “left hand turner” cut across my path with not even a car length warning! I’m a “lone wolf”- I don’t hang out, I ride! Old Road Harley Davidson in Santa Clarita, California. Other than riding motorcycles, what is your favorite hobby? Anything else about yourself or your riding experience you’d like to share with our readers? It’s my dream summer vacation to ship my motorcycle to Europe and ride through every country (especially Italy, where my father was born), and then ride over to Moscow, Russia and surprise my friends who live there! Have a cool bike and a good story? Share it with our readers! Contact us for details on how to submit your photos and story.